Holidays or visits by guests are the traditional reason to drink. Arguably, the word “to drink” has more synonyms than any other in Russian. “To yank,” “to nip,” “to cut into,” “to knock back”—all these verbs, and many others, are used in Russian to refer to the process of consuming alcohol. “Happiness in Rus means drinking; we can’t live without it.” According to legend, these words were spoken by the 10th-century Kievan Rus prince Vladimir when he chose Christianity as the Russian religion over Islam, as the former allowed consumption of alcohol and the latter propagated sobriety. 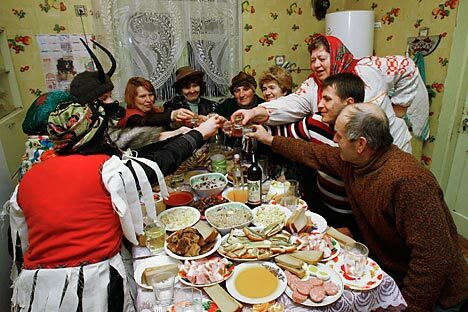 Then, in the 15th century, the Slavs learned to concoct so-called bread wine, which was the name for vodka at the time. The drink has now been considered the Russian national beverage for more than 500 years. Holidays or visits by guests are not the only traditional reason to drink. For example, a new purchase may inspire a celebratory drink. The word that describes this action in this context is obmyt’—literally, “to wash off” the item so it will last longer. But really, if there is a desire to drink, no special reason is required. If someone says, Chto-to stalo kholodat’ (“It’s started to get cold”), practically every Russian can complete this popular rhymed saying: Ne pora li nam poddat’? (“Isn’t it time we knocked one back?”)—that is, warm up with a drink. A standard bottle of vodka holds half a litre and thus is called a “half litre”—this word refers specifically to a bottle of vodka and not to any other beverage. Spirits are generally referred to as “alcohol,” and familiarly as “booze” (bukhlo) or “kir,” from the popular slang verbs meaning “to booze it up” (bukhat’ and kiryat’). In general, Russian dictionaries contain several dozen verbs that describe the process of drinking, and masters of ceremonies at Russian weddings entertain guests by staging contests to see who can list the greatest number of these verbs. During the Soviet era, in addition to vodka, so-called port wine was popular (especially among students)—cheap fortified wine was sold under this name. Due to its potency and ability to weaken people’s speech, it was called “mumbler” (bormotukha, from the verb bormotat’). “Should we send a runner out for a little bottle of wine?” In Soviet times, stores closed early, but it was easy to buy vodka from taxi drivers—naturally, for a higher price. In contemporary Russia, this problem did not exist until recently (alcohol was sold in 24-hour stores), but a few years ago restrictions were put in place: for example, no alcohol (except for beer) is sold after 11 p.m. in the city of Moscow or after 9 p.m. in the Moscow Region. A particular type of parody of the traditional ritual of the Russian feast can be seen in Georgy Daneliya’s comedy “Autumn Marathon.” In the film, a St Petersburg language and literature scholar and his guest, a Danish professor, are working on a translation of Dostoevsky. However, the locksmith neighbour keeps disrupting their work because on his free Thursdays he considers it completely normal to invite them over for a bottle of vodka in the morning. Because it would be awkward to refuse, the professor drinks with everyone else. When an uncomfortable silence then falls over the kitchen table, the locksmith breaks it with a line that became part of the popular lexicon in Russia: “We’re sitting pretty.” Returning to work on the translation is out of the question, and the locksmith and professor continue to get drunk together. After a routine trip to the store, the Danish professor ends up in the sobering-up station—a special night time institution for intoxicated people who are rounded up from the streets by the police and who emerge from this condition in the morning. “I’ve learned some new words,” the professor tells his colleague in the morning. “I’m an alkach, right?” He is right, but not completely. The correct form of this word is alkash, “alkie,” and it is a widely used short from of the word alkogolik, “alcoholic.” There is generally an accepted distinction between “alcoholic” and “drunk”: alcoholics suffer from in insurmountable physiological craving for alcohol, while a drunk can drink (moreover, usually quite a lot), but he can also not drink. The topic of alcohol makes frequent appearances in other Soviet films. In Sergey Bondarchuk’s “Destiny of a Man,” which was shot in the late 1950s, a Soviet prisoner of war amazes German officers with his ability to down three large glasses of vodka consecutively, and furthermore, he drinks the first two without chasers (“a Russian soldier doesn’t chase the first one—or the second one, for that matter”). However, the major film on this subject is without a doubt the 1970s cult hit “The Irony of Fate,” which for several decades has been broadcast on television every December 31, right before the New Year. The hero, who lives in a standard new building in Moscow, goes with three friends to a bathhouse on December 31, then after a few bottles of vodka flies with one of them to Leningrad. There, in a drunken oblivion, he ends up on the New Year in a standard apartment with the identical standard address, but in Leningrad, as St Petersburg was then called. The comedic developments of the relationship with the woman who lives in the Leningrad apartment unexpectedly evolve into romantic feelings, and everything leads to a radical change in the characters’ personal lives.